There's something about custom tees that are just so fun to make. Anything that you can dream up, can go on the fabric. So many silly and personalized options! And mercy, save alllll the money from those custom tshirt shops! I've tried quite a few styles of DIY graphic clothing (like this stenciled tee!) but I can honestly say that this one might be the easiest. And the supply list is pretty short here too! Outside of regular household items (a computer for printing your design and an iron), all that you need is a blank shirt and an ink transfer pen. Note: The ink doesn't transfer super dark. It's more of a faded look. So I'd stick with a white shirt when using this method. Start with your design! Create something yourself or find the perfect image online. Size it according to your shirt size. I'm making a little tee for Eliza so I needed to measure this itty bitty top to make sure I didn't have an image that was too big. 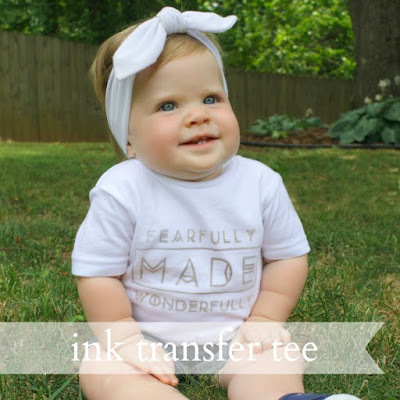 I've been wanting a tshirt for her with "fearfully and wonderfully made"designed on it, so that's just what I created! Before printing, flip your graphic to a mirror image. Next, trace all of the lines on your image with your ink transfer pen. Be thorough! I found with my pen, it was better to trace over the lines twice for extra ink. Finally, iron the image onto your shirt! I'd recommend following the basic direction with your specific pen. And be careful to make sure the image doesn't slide or the graphic will be blurry. I stuck a little tape on the top two corners to keep mine from sliding. I'm loving this sweet Psalm 139 shirt on my gal!! Love this shirt! I definitely am going to try this.